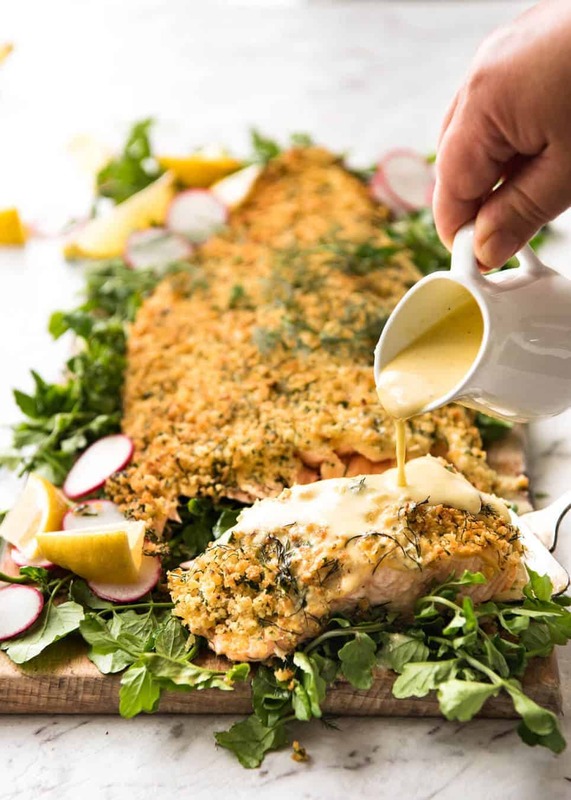 This Baked Parmesan Crusted Salmon is a stunning show stopper that’s very easy to make. The parmesan crust is insanely delicious and the Lemon Cream Sauce for the salmon is the essential finishing touch. A spectacular salmon for Christmas dinner or other special occasions, and yet so fast you could make it midweek. Plus you can prepare everything ahead- even the sauce! Food that tastes like a million dollars and yet is simple to make and made with every day ingredients. That is the absolute essence of the food I love and share here on RecipeTin Eats. 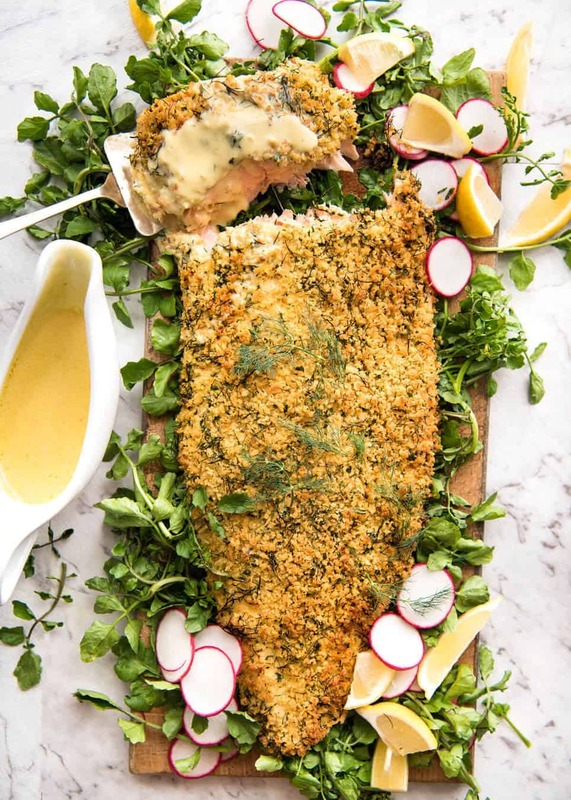 This Parmesan Crusted Salmon is pretty much me on a plate. Well, on a platter. A large platter. 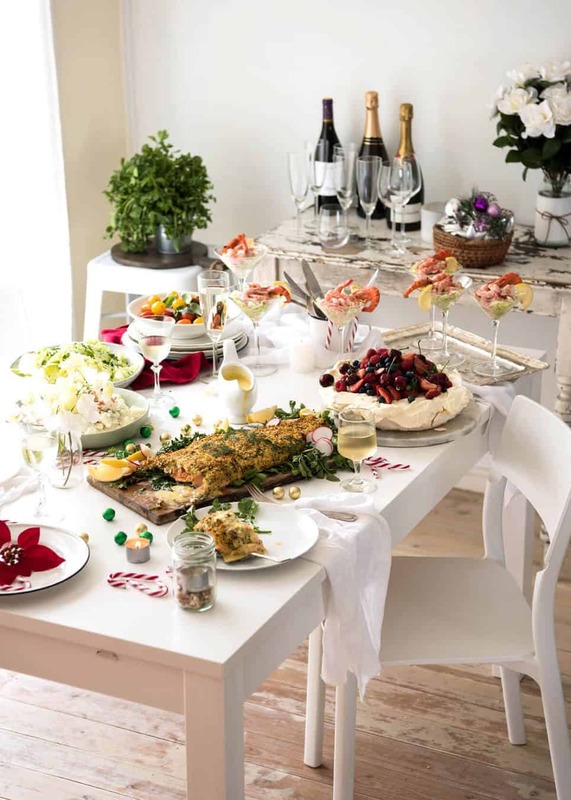 Because the best sort of food is food that is shared with family and friends! ? Every year, I do a Thanksgiving and Christmas menu (see below recipe for list with links). 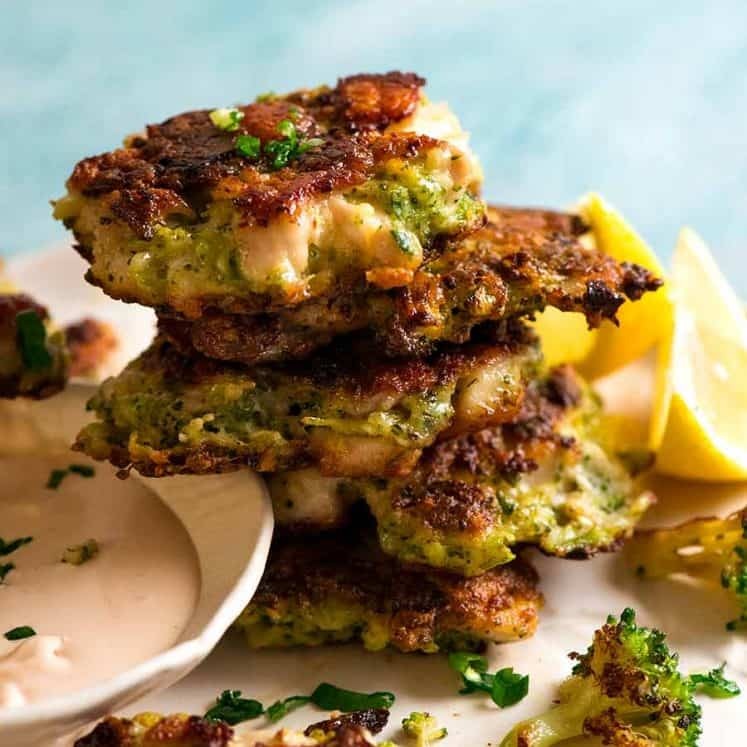 It’s my mission to make you the most popular person at gatherings with finger food your friends will go mad over, and to make holiday feasting stress free with easy to make, mostly prepare ahead recipes. And insanely delicious of course. Taste first and foremost! 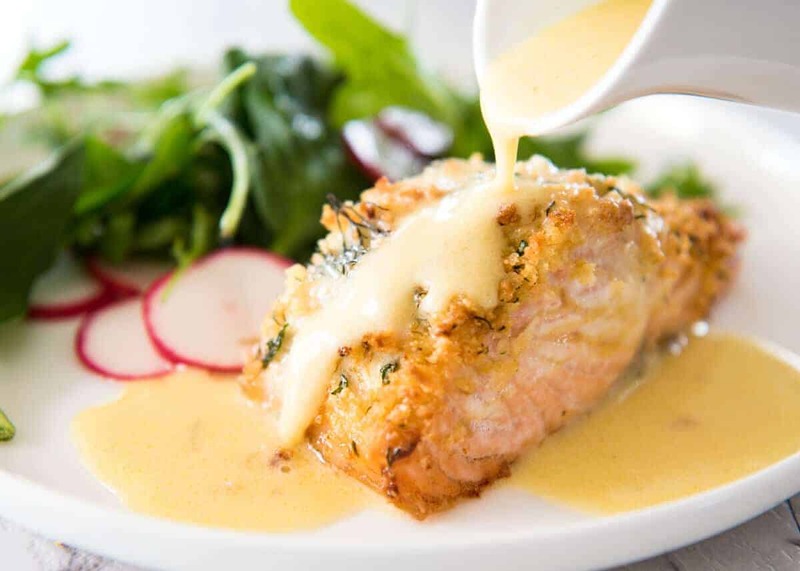 For this year, the centrepiece of my Christmas Menu is this Baked Parmesan Crusted Salmon, served with a heavenly Lemon Cream Sauce. Please don’t skip the sauce! I know many people make similar recipes without a sauce. I really, really, really think that the Lemon Cream Sauce is necessary because this salmon is not marinated or glazed. Whole salmon fillets are quite thick and meaty so unless it is marinated or has lots of yummy glaze to use as the sauce, it lacks flavour inside. 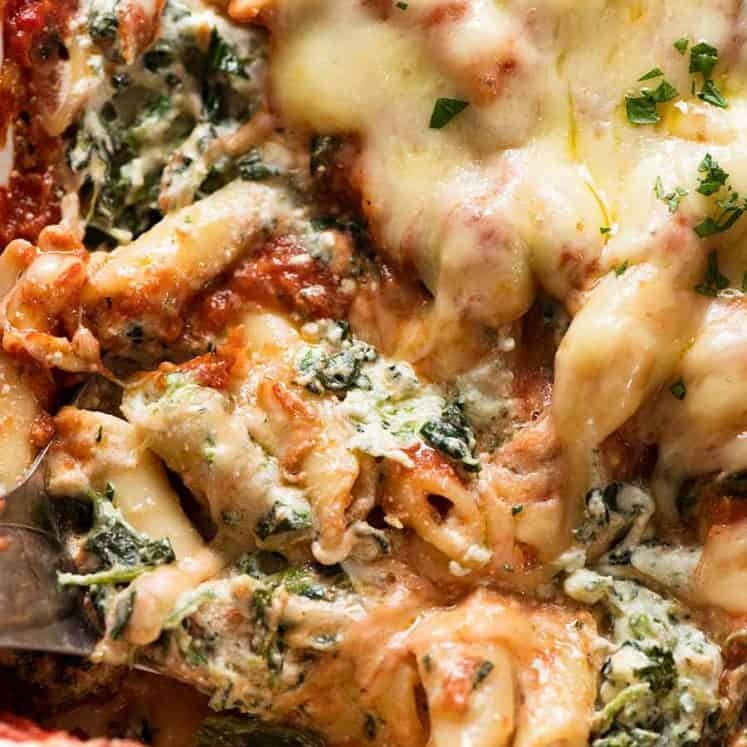 Plus, look how the sauce clings onto that crunchy parmesan topping. Swoon…. 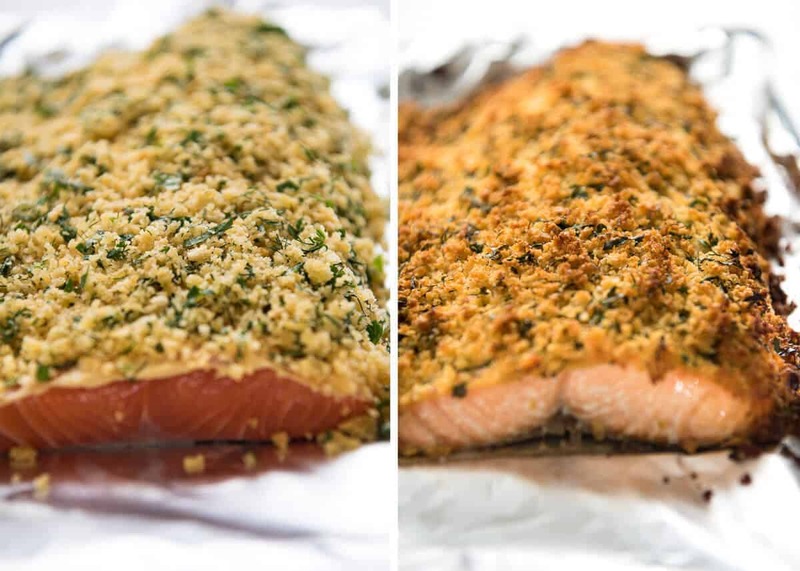 I promised you this Baked Parmesan Crusted Salmon is easy to make and here are some prep photos to prove it! It starts with a very simple panko and parmesan topping. With one little trick. I like my crumb to be beautifully golden all over rather than splotches of burnt bits here and there which is what happens if you bake rather than fry crumbed things. Psst This is much easier, less effort and more even browning than toasting in a skillet. Plus less cleaning up because I use the same tray for the salmon.?? My next trick – getting that beautiful parmesan topping to stick to the salmon. Easy fix – just spread Dijon mustard on the salmon like you’re buttering toast. 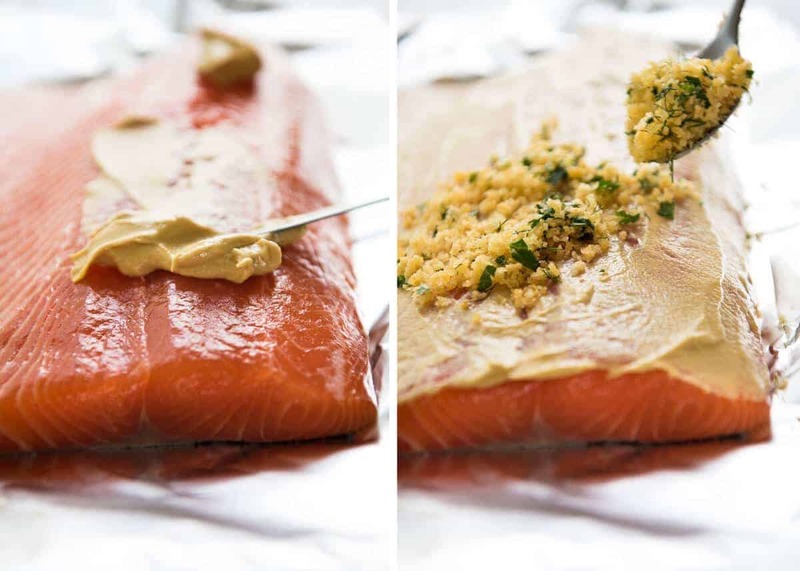 Mustard is the perfect glue because it’s got a bit of tang (perfect match for rich salmon) plus flavour. Bake it for 20 minutes in a fairly hot oven and this is what you get….. So beautiful and tastes incredible, especially served with a simple Lemon Cream sauce. Yes the sauce has cream in it but I promise it doesn’t make this too rich! In fact, that’s a specific point my taste testers made. You hear the word “cream sauce” and assume it is very rich. But actually, this sauce is quite tangy from the lemon. It adds moisture to this dish as well as the zing cutting through the richness of the salmon. I love how honest they are with their feedback – trust me, they don’t hold back and I have actually held off posting a handful of recipes until I improve them further!! 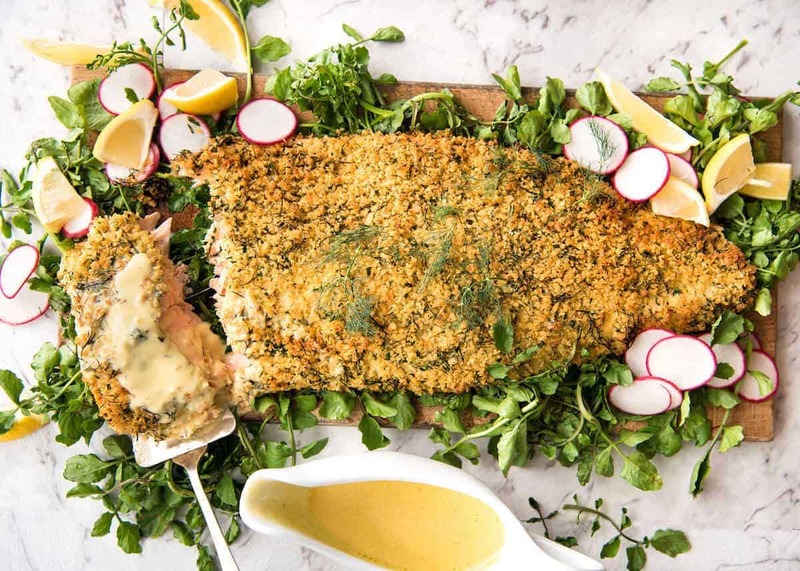 A simple showstopper salmon recipe! Fantastic centrepiece for a special occasion yet easy enough for midweek. Don't skip the sauce! It makes all the difference to this dish because the salmon is not marinated. Though made with cream, it is not rich, it's quite tangy - perfect pairing with rich salmon. Take salmon out of the fridge to bring to room temperature. Preheat oven to 180C / 350F (fan / convection) or 200C / 390F (standard). Spread panko on baking tray, spray generously with oil then bake for 3 to 5 minutes until light golden brown. (Note 6) Scrape into bowl immediately. Add butter and stir, then add remaining Parmesan Crumb ingredients. Line same tray with foil. Place salmon on foil. Spread Dijon on salmon using a butter knife. Just a thin coating - like buttering toast. Remove from oven. Loosen salmon from foil using egg flip or butter knife - skin will hopefully be stuck to foil. Plate watercress on serving platter. Use foil to lift salmon onto watercress on serving plate, then slide out the foil from under it (see video under recipe). Serve with Lemon Cream Sauce and lemon wedges on the side. Melt butter in a saucepan over medium high heat. Add eschalots and cook for 2 minutes. Add wine and bring to boil. Leave to boil rapidly for 5 minutes or until reduced by 3/4 or so. Turn heat down to medium. Add cream, sugar, salt and pepper. Stir, then add lemon juice and mustard. Stir again. 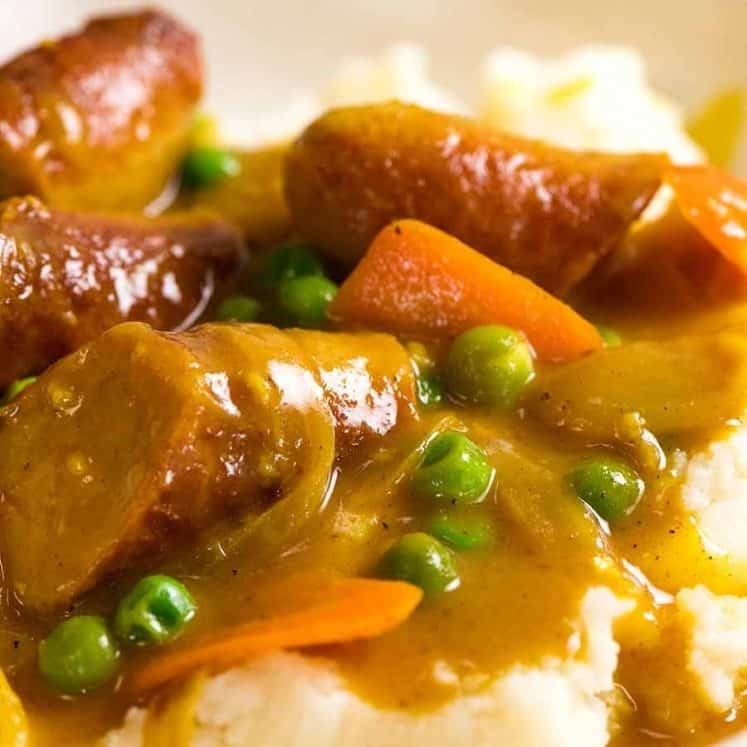 Simmer for 2 to 3 minutes or until thickened (see video). Adjust salt, pepper and lemon to taste. Be generous with the salt - remember the salmon is not marinated, the only salt is in the topping. Optional: strain. I don't bother. Allow to cool for 10 minutes or so. It will thicken as it cools. It can be served warm or at room temperature. 1. Skin on or off is fine, and ask your fish monger to remove the bones. 2. 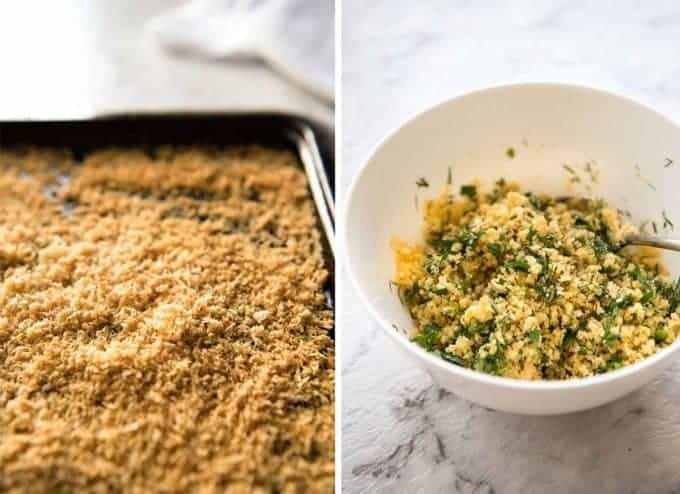 Panko breadcrumbs are chunkier than normal ones so they make a better crust. 3. Store bought is denser than freshly grated so if you are grating your own, use more. 4. Eschalots are mini onions. They are slightly sweeter. This can be substituted with spring onions / shallots / scallions (white part) or even normal onion. You need 2 tbsp. Or use 1 1/2 tsp minced garlic. 5. Or fish stock/broth or chicken broth. 6. This step is key to ensuring your salmon comes out with a beautiful evenly golden crust, rather than with splotches of burnt bits / overcooking your salmon to get the breadcrumb to go golden. If your oven doesn't cook evenly, you may wish to shake the tray once. 7. My salmon was 1.2 kg / 2.4 lb and 2.5cm / 1" thick at the thickest part and it was at room temperature. 20 minutes yielded a perfectly "just cooked" salmon that is very moist. Use a knife to take a peek if you want - you can cover it back up with crumbs, no one will ever know! If your salmon is fridge cold, add 3 minute to the cook time. TO TAKE SOMEWHERE with no oven: In Australia, many people have a Christmas Day lunch at parks and beaches. So a reader asked me how one might prepare this for a picnic. I think this will work great to take components separately and just assemble: bake salmon with just a sprinkle of salt and pepper. Cool then wrap. Toast panko crumbing (with butter, parmesan etc) for 8 min or so, shaking tray a few times so it toasts evenly, until deep golden like in the photos. Transfer immediately to container (it keeps toasting on hot tray), allow to cool then seal. Mix together mayo + mustard (equal amounts) - juicier than plain mustard which will be better with cool salmon. Make sauce and allow to cool. Thin out sauce with a bit of water so it's pourable at the temp you expect to serve it. Then on the day of, assemble the salmon just prior to serving. Salmon and sauce is best served at room temperature rather than cold. Voila! Crunchy topping! 9. 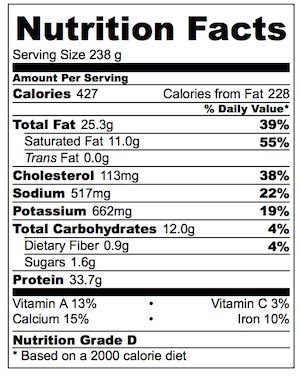 I like to allow for 180 - 200 g / 6 -7 oz of fish per serving or if it is part of a larger feast. If being extra cautious / large appetites, I do 250g / 8 oz per head. 10. Lemon Cream Sauce - I know 1 1/2 cups of cream sounds like a lot, and it is! But this serves 8 people so it's about 2 tbsp of cream per person which is not very much. Also the sauce is not rich, it is tangy from the lemon and mustard and cuts through the richness of the salmon. Perfect pairing! 11. Nutrition assuming 8 servings and that all the sauce is consumed. 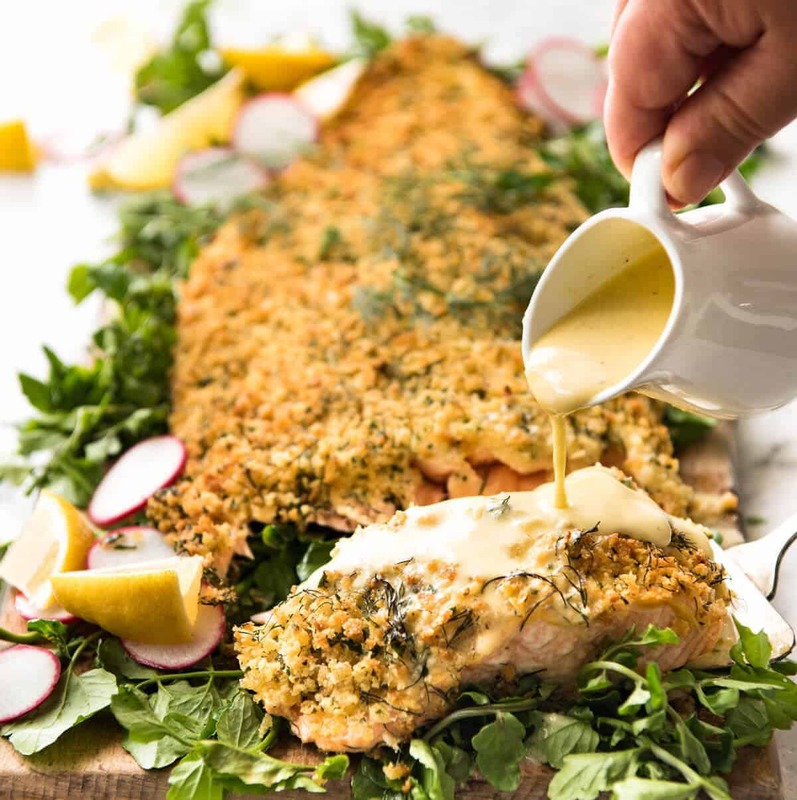 Baked Parmesan Crusted Salmon recipe video! There’s always someone sulking during festive times…..
2016 Thanksgiving – “Going South” A Southern Feast starring a One Roasting Pan Cajun Turkey Breast and Dressing and all the essential sides. 2015 Christmas – “Family Japanese Christmas” Starring a family recipe, my mother’s Miso Marinated Side of Salmon plus our favourite sides! And here’s a sneak peak at the 2016 Christmas Menu! Coming soon…..
Just made .. Nagi, you are a genius .. it was AMAZING!! Nagi this salmon was AMAZING!! My husband said it’s the best fish I’ve ever made! Woot!! I’m so glad it was a hit! Hi Danielle, you sure could! Hi Viveca, I’m so glad you love it!! Any salad should be great along side, but if you’re after vegetables, try magic broccoli, some smashed potatoes, garlic butter rice with kale or even my lentil salad! This is a great recipe. My 7 yr old wasn’t sure at first but ended up licking the plate. This is the best news!!! Hi, I’m a big fan of your site & cooking! Your recipes are consistently excellent, and I particularly love how you include lots of notes for variation & substitution. On this Salmon recipe in particular, it was amazing! The taste was so subtle, delicious, and easy to prepare. Thank you! I’m so happy you loved it Noelle, thanks for taking the time to let me know! Thank you so much for this recipe. It is very nice, tasty and easy to prepare. Made this along with a couple of sauces for prawns I also found here. 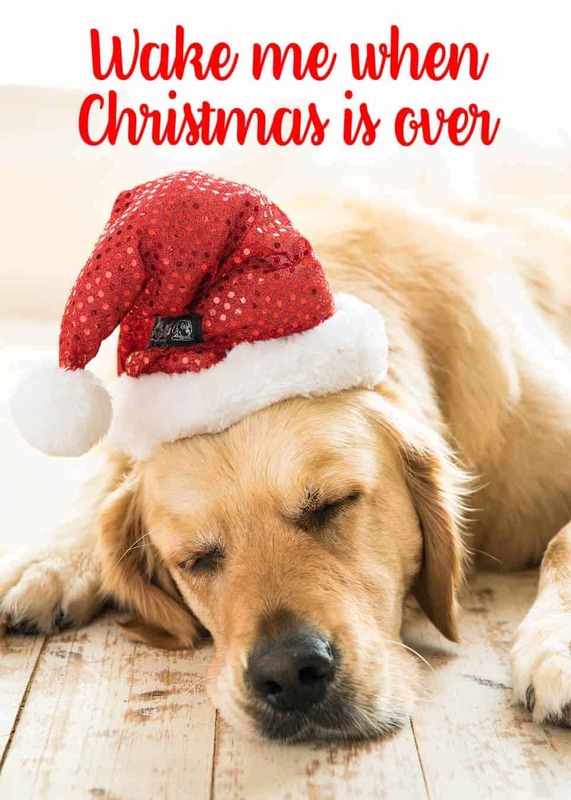 All the prep was done the day before and it made Christmas Day stress free. Thanks for the recipe. I will definitely do it again. I LOVE THIS RECIPE! I’ve made it the last two years for Christmas and it has been a mega hit each time. It’s so easy and delicious. I made it per the instructions and it easily fed 8 people with some extra to spare. Definitely making the Salmon, sounds amazing and such a special treat! BTW, I’m making the Arancini rice balls for xmas eve. I’ll begin with the Italian Cheese Log. I’m going to do the salmon on Christmas day. Can’t wait!